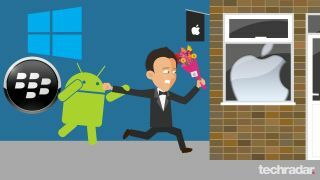 Apple, it's all over with Android. Please take me back. You know that feeling? The one where you wake up, realising you should never have broken up with that ex? Like you've made a huge mistake? Anyway, I found myself packaging up my Android wares to send to some eager eBay geek, removing my pride and walking into an Apple store to buy not one, but TWO products. An iPhone 5S and an iPad Air. Yeah, me. Mr Android. The guy who thinks the Galaxy S4 is the best thing since.. No, BETTER, than sliced bread. In an Apple shop. The very thought of it. The thing is, after seven months of using the Galaxy S4 (and convincing friends to plump for one over the iPhone - now, that's awkward) the time has come to ring the changes. Not because I was fed up of the device, but the ecosystem. All too often, I'd download something that was available for both the iPhone and Android devices and find that the Android version was just far inferior. Even big ones like the official X-Factor app (which I downloaded for research purposes, only - HONEST) - flawless on the iPhone, worse than rubbish on Android. Slower than a dead snail. Talk about the poor relative - except it costs bucketloads. I even toyed with Windows Phone and BlackBerry - but in the same way you date the crazy people to make sure you know what to avoid next time. And then there is the dreaded A-word - ads. I HATE ads in my apps. I'm more than happy to pay for the ad-free versions. I'm sitting here with the cash, Google. But a lot of Android apps don't even give you the option. You're stuck with ads, like it or not. It's infuriating. Especially if you're rocking an absolutely gorgeous item like the HTC One, and can't get past the Domino's Pizza popups. I'm not saying the iPad or the iPhone are superior overall - but that Apple phrase of "it just works" does come into play here. Things like my car stereo - flawless with bluetooth over iDevices. Errors with the Galaxy S4 and HTC One 90% of the time. It was getting too stressful. Having to pull over constantly just to reconnect. Yeah, that's one car stereo - but it's symbolic of a bigger issue. It's Android's achilles heel really - the platform is so popular, so open, there are too many devices for manufacturers to ensure compatibility. So they concentrate their efforts on Apple devices. And it's the same with apps - things like the iPlayer app supporting downloads. You know it'll work on an iDevice, but if you want the same on an Android machine, it's a lottery. And don't get me started on voice recognition. I bemoaned this a few months back - Google's attempt at voice actions is DIRE. Even with the improved Google Now, it just isn't there. So you'll find one does one thing better than the other and before you know it, you're using six different apps to do what one app should be able to do and fast approaching willingly chucking your Android device under the nearest bus. This is where I love Siri. He's not perfect, but boy, was I glad to hear his voice. It was soothing, relaxing and welcome, a purring tone in a midst of confusing cards. Apple controls its products - and it controls them far too much. But like a blind lemming, I just want to be controlled for a bit. I want to hand over the steering wheel to Cupertino. But like the ex who can't say no, I may fall out of love again. After all, the Galaxy S5 can't be that far away now, right?